Pranayama Workshop "Preparing for Stillness"
Come and learn how to progress into the deeper practices of Pranayama. Pranayama, is the practice of ancient yogic breathing techniques. It is the practice of consciously controlling the flow of breath, and thus enhancing the flow of energy in the body. A regular, balanced pranayama practice increases prana (life energy), thereby inviting greater mental clarity, heightened healing potential and deeper self-understanding. Pranayama, like other yogic practices, is about being more fully alive and well, and is particularly helpful in the preparation for meditation. This workshop will provide you with understanding, instruction and practice of pranayama techniques that you can deepen and integrate into your current routine. Saturday November 4th 2-5. Suggested donation $35.00. Please pre-register with Manjula at 706-548-3625 or satchidanandamission@gmail.com. Please join for Kirtan! All are welcome. Please join us for these special programs with Swami Ramananda. Can't join us but want to help support our dear Swamiji? Donate here. Join us any time from 2:00-4:00 pm on the first Sunday of every month at Satchidananda Mission for the study of the moral and ethical precepts of Yoga. We will meet once a month to study and practice the first two limbs of Sri Patanjali's eight limbed system known as Yama, Niyama. These observances are the foundation to all Yoga practice. We will journey through these philosophical guidelines with a book by Deborah Adele simply called "The Yamas & Niyamas." This translation offers these ancient teachings in such a way that they are applicable to every aspect of our modern lives. The teachings are woven into practical examples and stories. Please come prepared with a journal and a copy of "The Yamas & Niyamas" by Deborah Adele. Each session will end with a week by week assignment to apply the practices. This program is offered for a suggested donation of $5 per session to cover the cost of the space. All are welcome. Please join and explore a more skillful way to live. 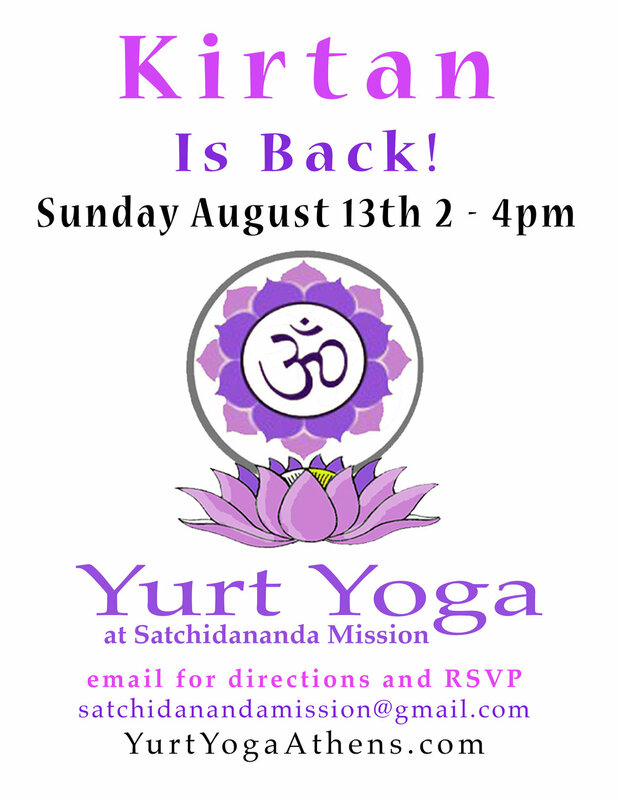 Satchidananda Mission would like to welcome the Athens Community Singing Circle to the Yurt. The singing circle meets the first Monday of each month from 7:00-9:00pm. Every one is welcome to join. We come together for the pure joy of singing and sharing songs. Jenny Derevere holds the space and leads us through the gathering. Please feel free to join us each month as we raise our voices in celebration of life. Friend us on the singing circle of Athens Ga. community Facebook page. Donations to help support the space are most gratefully accepted. Satchidananda Mission is offering Basic Teacher Training in 2016. The entire course is broken up into two sessions: May 14th- May 28th and Dec. 16th - 29th.